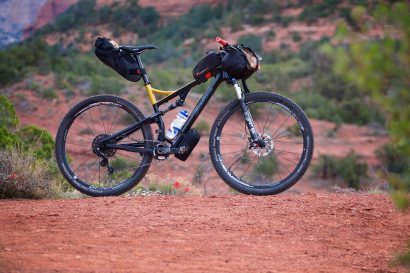 When gearing up for a bikepacking trip, a few important considerations frame my equipment selection. I assess the weather, water availability, anticipated mileage, and naturally factor in how much luxury I want to haul as every added gram conspires to slow progress and erode the very comfort I hope to achieve. Whereas some outings mandate the bare minimum in an effort to cover maximum miles, others allow for far more packing latitude. For my most recent trip into the deep canyons of southern Utah, I decided I could splurge in terms of camp niceties. Early spring temperatures are usually mild and my route included at least two reliable refill opportunities. I knew the nights would be chilly, but daytime temps pleasant. The mileage was modest, so I decided I could tote a few extra grams and just concede to ride at a slower tempo. With my criteria set, I started to assemble the pieces. 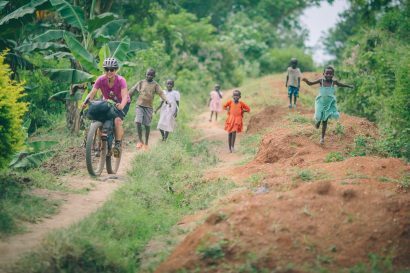 The foundation to my gear sorting started with the bike itself and its gear-hauling capacity. 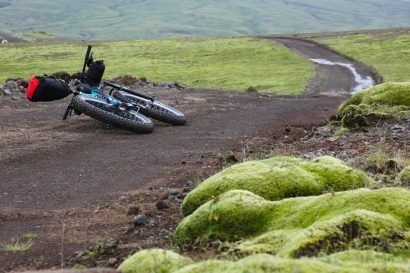 For this escape I jumped at the chance to ride my new Salsa Cycles Mukluk Carbon XO1. 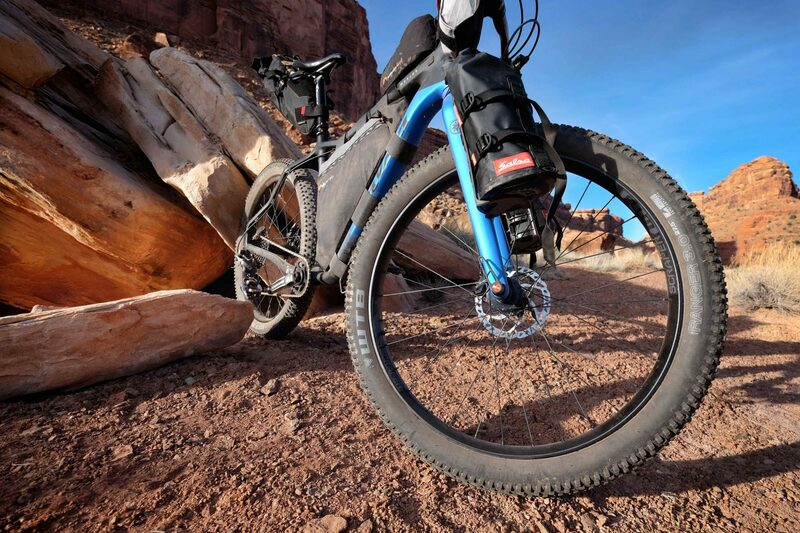 Normally fitted with 5-inch wide tires on carbon rims, I swapped them out for narrower, more efficient, 27.5-inch wheels fitted with 3-inch tires. The Mukluk is if anything a pack mule and can shoulder far more weight than I care to push. My setup, at least for this ride, included a seat bag, custom frame bag, dual Salsa Anything HD cages on the forks, and a small backpack used primarily to carry my camera and hydration reservoir. As I am prone to do, I omitted a handlebar bag as I prefer an uncluttered cockpit and the lower weight distribution of fork-mounted gear. Because I wanted a more relaxed and comfortable time in the desert, I opted to pack a proper tent. 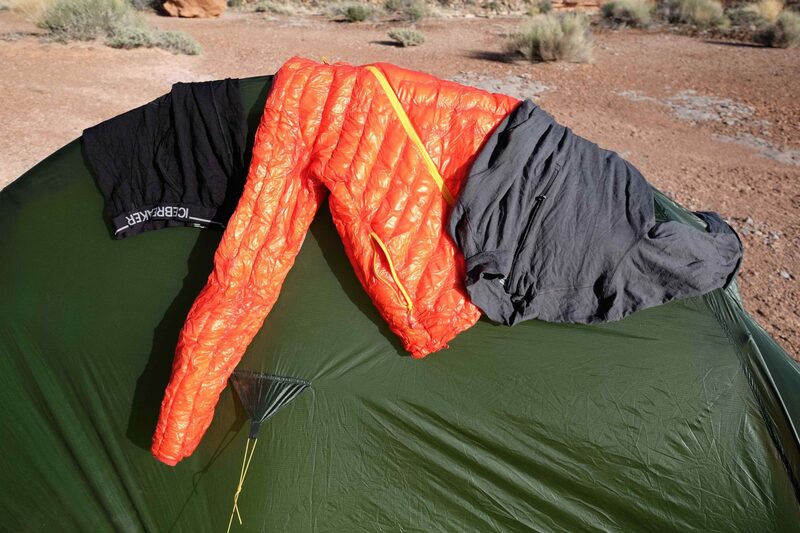 Spring in Utah gets windy, which is why I chose to pack Terra Nova’s Solar Photon 2. 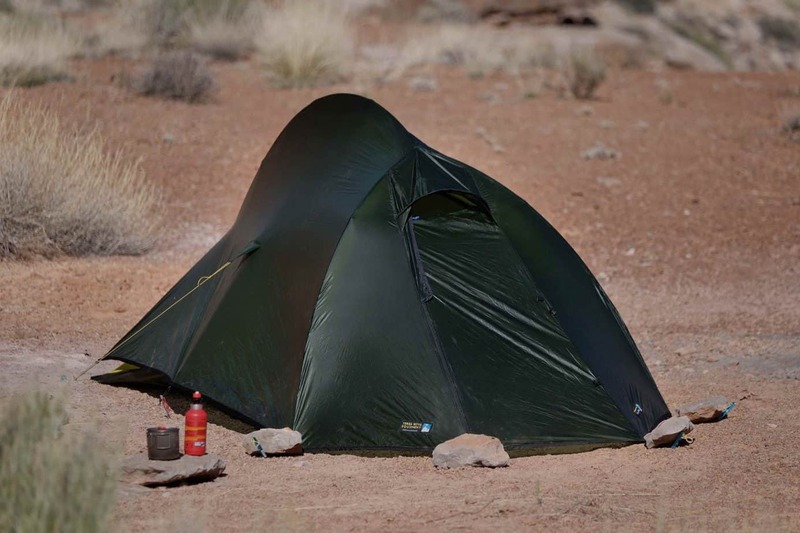 With very little exposed mesh, it fends off blowing sand better than most light shelters and the full coverage rain fly can greatly reduce the accumulation of dust within. As temps dropped to just above freezing, the full coverage fly helped retain heat and shut out cold drafts. At a whisper over 2 pounds and sized for two people, albeit a very friendly duo, it has spacious room for one. Look for a review of the Solar Photon 2 in the future. Considering the ground can be quite cold in early spring, I elected to sleep on a full-length, 2.5-inch thick Thermarest NeoAir XLite sleeping pad (340 grams). It’s a trusted pad I’ve used for several years. 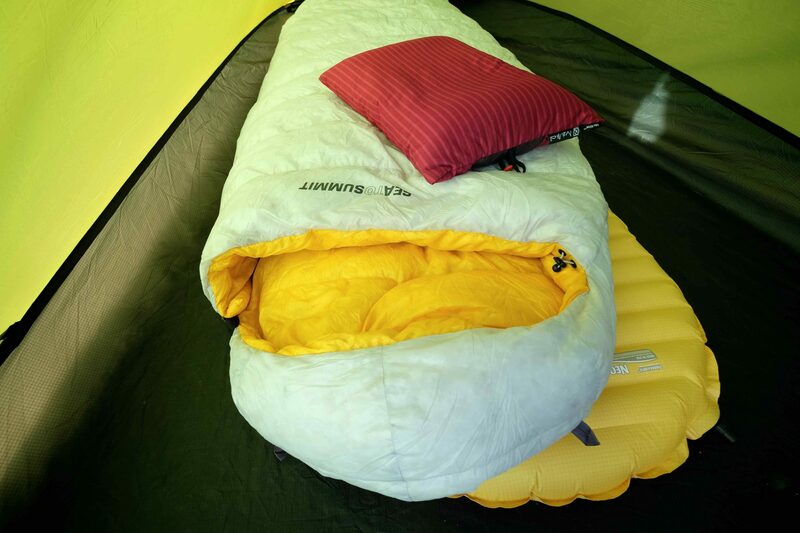 Atop that I curled up in a Sea to Summit Spark SpII 35ºF sleeping bag. I’m a huge fan of the Spark series of bags from Sea to Summit as they compress to near nothing and provide incredible warmth for the 464-gram weight. Although it’s a touch narrow, even for a beanpole like me, I find it is sufficiently comfortable for a long night’s sleep. A Nemo Fillo Elite inflatable pillow (80 grams) rounded out my very comfortable bed. 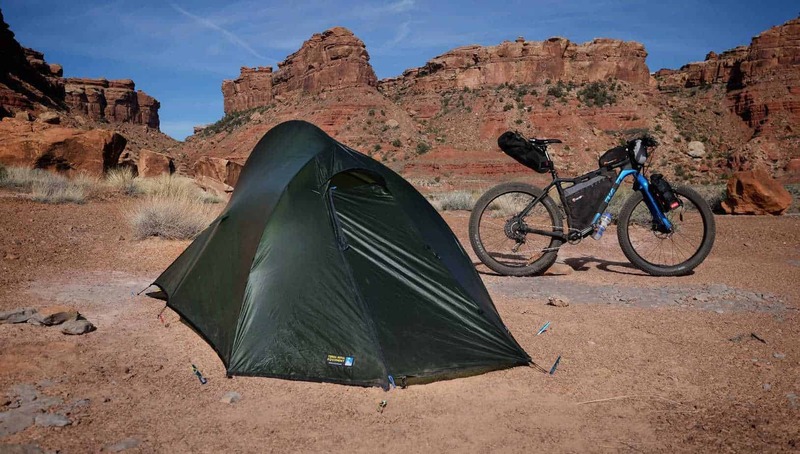 Without an excessive amount of miles on my agenda, I knew I’d have ample time in camp, so making it a nice place to be and sleep felt like a smart thing to do. The last pieces of critical sleep gear were base layers. Used exclusively at night like backcountry pajamas, they keep my bag clean, augment warmth, and serve as light and comfortable alternatives to sweaty cycling clothes. When foul weather hits, my sleeping layers are always dry and welcome relief at day’s end. My longtime favorites are Icebreaker 200-weight merino wool tops and bottoms. Within that kit I also keep a 200-weight wool beanie for added head protection and 200-weight gloves. Covered head to toe in soft wool, I was able to sleep comfortably at my bag’s lower limit of comfort range. I used to be an ardent fan of dehydrated meals, particularly those from Good To-Go, but as a newly diagnosed type 1 diabetic, carbohydrates are best consumed in moderation and few pre-packaged meals fit the bill. 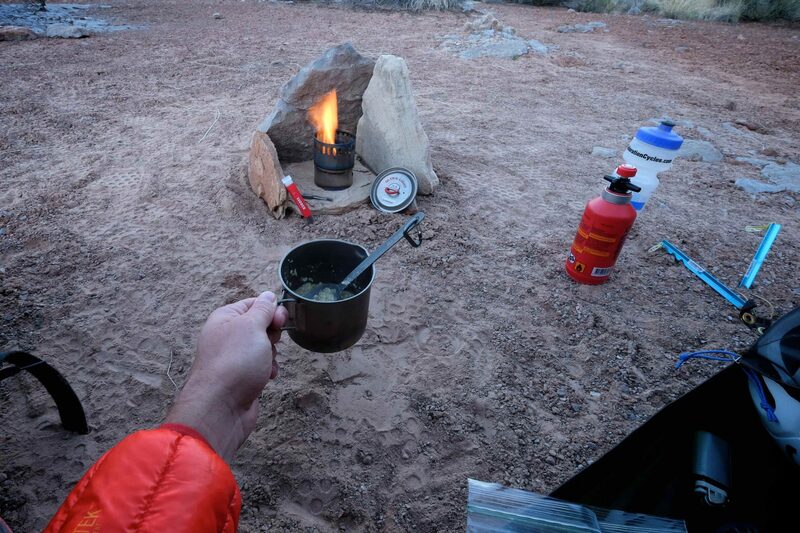 I do enjoy a cup of morning coffee, hot soup, or tea before bed, so I still pack a stove. My new favorite is the Evernew Appalachian Stove/Pot combo. At only 161 grams for the whole kit, I can have water boiling in minutes with no fuss, no parts to break or lose, and no worries about maintenance, cleaning, or other issues. It’s a little fickle in windy conditions, but nature usually provides solutions like my fancy rock kitchen below. I like to keep my stove within reach of my tent door so I can get my coffee brewing quickly while still in my bag. I struggle to stay properly hydrated and find the only way I consume enough water is to have it accessible in a hydration reservoir on my back. 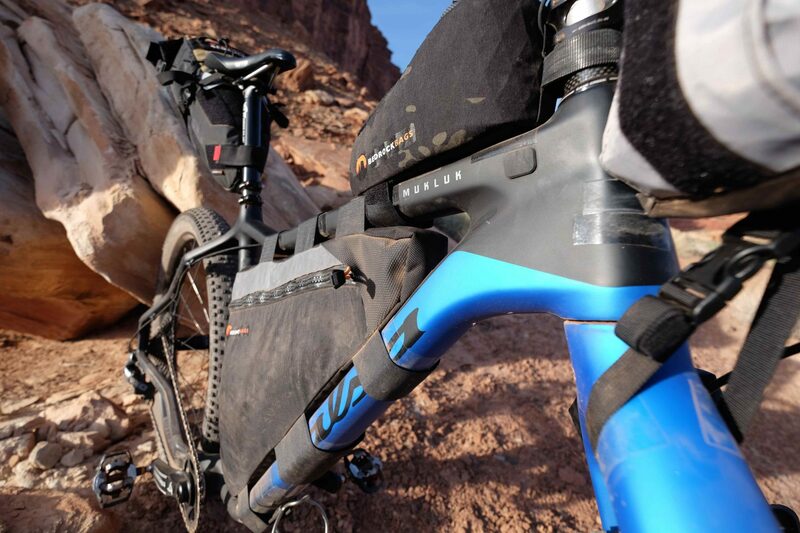 I like Osprey’s latest Hydraulics 3-liter drink system with an easy to fill top and quick-release hose couplers. 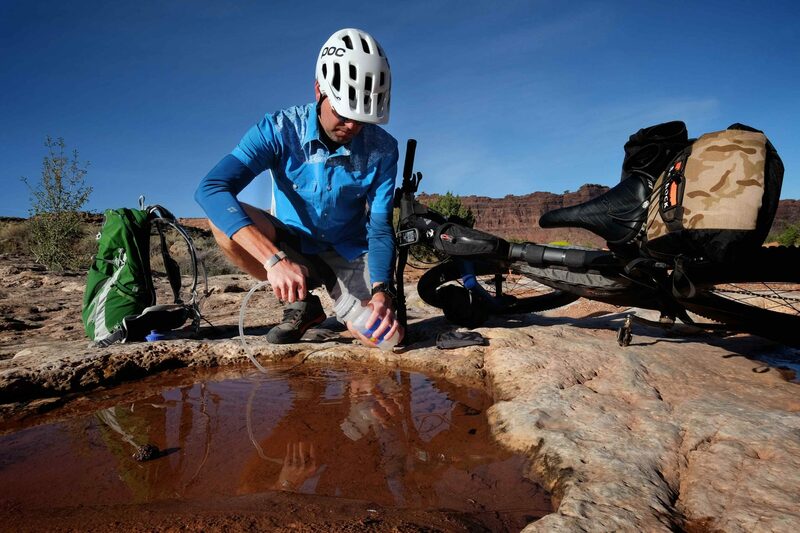 Additional water storage is provided by the all-new Hydrapak Seeker 3L soft bottle. 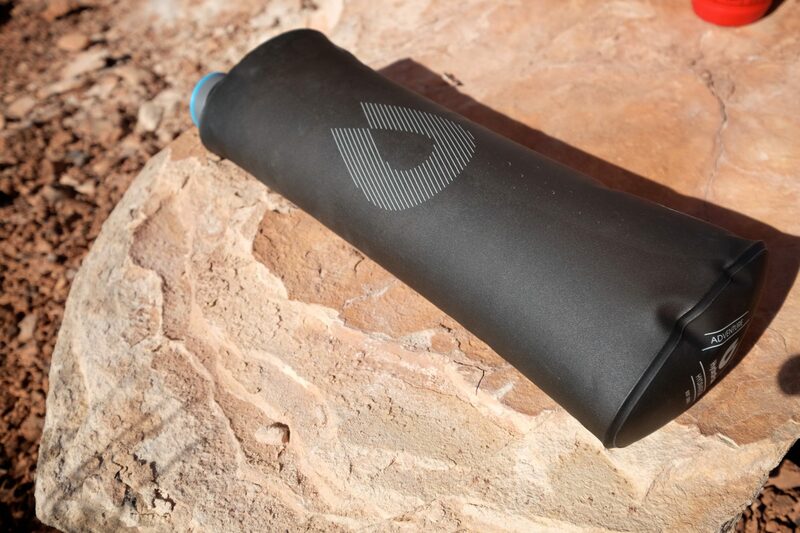 Surprisingly durable for the low weight, it holds enough water to last an evening in camp with ample volume to rehydrate meals, make coffee, and even rinse my face. As a general rule, I always try to finish every ride with at least one liter of water left in reserve. That water could be a lifesaver in the event I can’t get back to the car. I keep that extra water mounted below my down tube. I often carry a spare 1-liter Platypus soft bottle as a backup, electing to fill it only if necessary. Water treatment is trusted to MSR’s brand new TrailShot Microfilter (142 grams). It’s tiny but efficient. Choosing a water treatment system has many variables. For desert travel, sometimes the opportunities to refill are few and far between, so processing lots of water at one time is the key. For my most recent trip, spring rains had filled many of the natural pots along the route making for frequent water opportunities. I could refill on the fly every few hours and a small, fast, easy to use filter like the TrailShot was the perfect solution. Read my full review of the TrailShot [Here]. There are a few small items I like to keep handy. That list includes a Black Diamond Storm Headlamp (110 grams), Victorinox Camper pocket knife, sunscreen, SPF 15 lip balm, Action Wipes, hand sanitizer, toilet paper, and zip locks to pack it out. I have used LokSak bags for years and trust them over store-bought food bags. As a type 1 diabetic, this category keeps me awake at night. An untreated low blood sugar event could put me in a coma—or worse. My emergency kit contains all of the supplies necessary to treat cuts, blisters, and burns, as well as low blood sugar episodes. Although I assume it won’t always work, I carry a Delorme inReach satellite messaging device. People often ask me about backups and additional emergency gear. Everything I carry is an asset in an emergency so there’s no need to double up. This kit contains everything I would need to repair tire damage. That includes an extra tube, patches, spare valve, additional tire sealant, tire boots, plugs, upholstery needle and thread, three tire levers (in case one breaks), pump, and super glue. I carry a multi-tool with integrated chain breaker and an extra power link. For short trips I won’t carry an extra set of brake pads, but will bring a small bottle of chain lube. I also bring zip ties and duct tape. Important tip: Most repair items you need to stay rolling are tiny. Why not carry a needle and tread? It weighs a few grams and packs down to nothing. Same for extra cleat bolts or chain links. If you think you might need it, you do. Many new bikepackers splurge on bikes and gear, but skimp on the most important items in their arsenal: apparel. I almost never leave home without waterproof/breathable layers top and bottom. 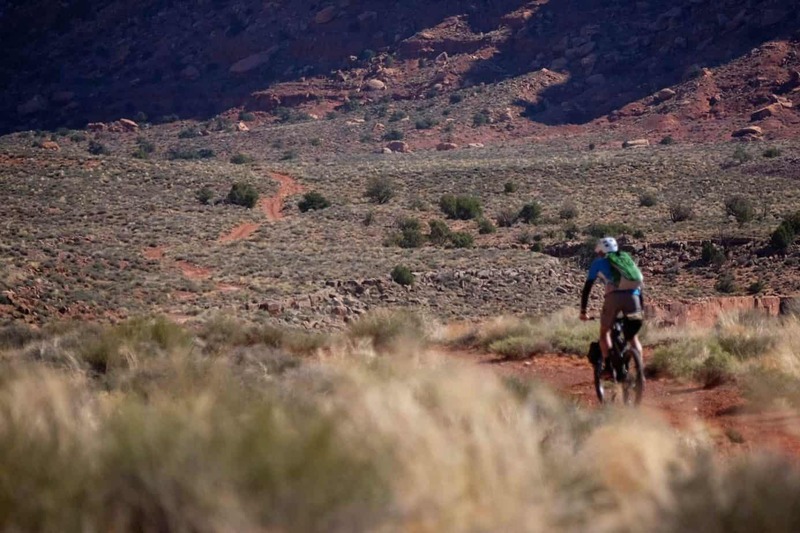 In warmer months I pack Gore Apparel’s Power Trail Active Gore-Tex shorts. They pack small and really, when was the last time you worried about getting your shins wet? For my upper half I wear Gore’s Power Trail Active Gore-Tex jacket. For this particular trip, rain is not an option as it makes the roads impassible, so why bother with hard-core rain gear? I did take a waterproof pullover from Bergans as it only weighs a few grams. I naturally bring a good pair of riding shorts and a comfortable shirt, typically with long sleeves to defend against sun, particularly in the summer. For this time of year in southern Utah, I also included an 800-fill down jacket, if only to wear around camp. The last essential is a Buff which I use as a thin hat, neck, or ear warmer. This is a tough one given my nutritional limitations but I tend to fuel myself quite well on almond butter, cheese, sausage, 80 percent cacao dark chocolate, olives, nuts, and jerky. These ready-to-eat foods are heavy but they require no water to prepare, nor any for cleanup. In the evenings I’ll often include a warm cup of instant soup, or a small portion of dehydrated black beans for protein. Food can get heavy and bulky, so experimenting with each trip is inevitable. In warm months I’m sure to include electrolyte tabs to drop in my water. On this outing, I also tried a couple of meals from Packit Gourmet. Their roast beef and chicken salad lunch kits can be rehydrated with cold water and honestly taste pretty darn good. If I select my kit properly, I have everything I need, and nothing more. Only emergency items and perhaps storm layers may go unused if good fortune smiles on my trip. 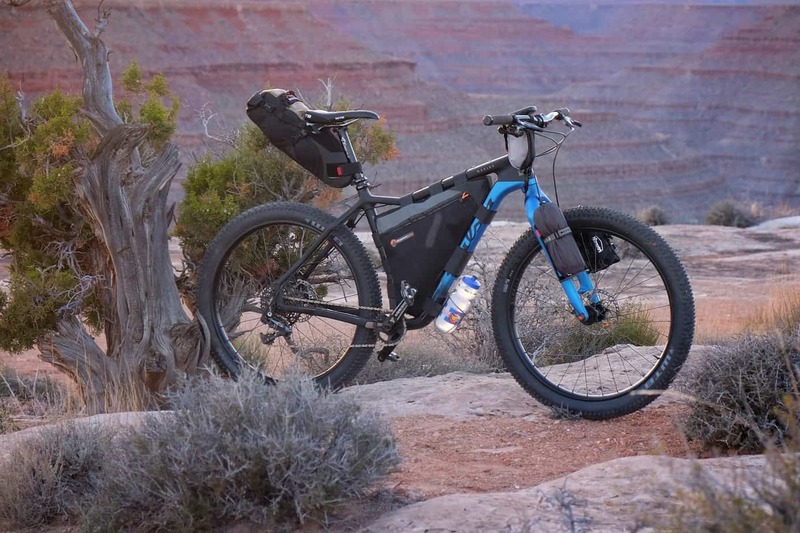 After more than 20 years of bike travel, I have learned that while each trip I prepare for has certain reoccurring items I pack, no two trips are ever the same. I have certainly left things behind I wished I hadn’t and visa versa. Practice will make perfect, or as close to it as anyone can get. Once I get to camp, my bags sort of puke all of my gear onto a rock. Everything tends to go from neatly organized to a pile of chaos quickly. 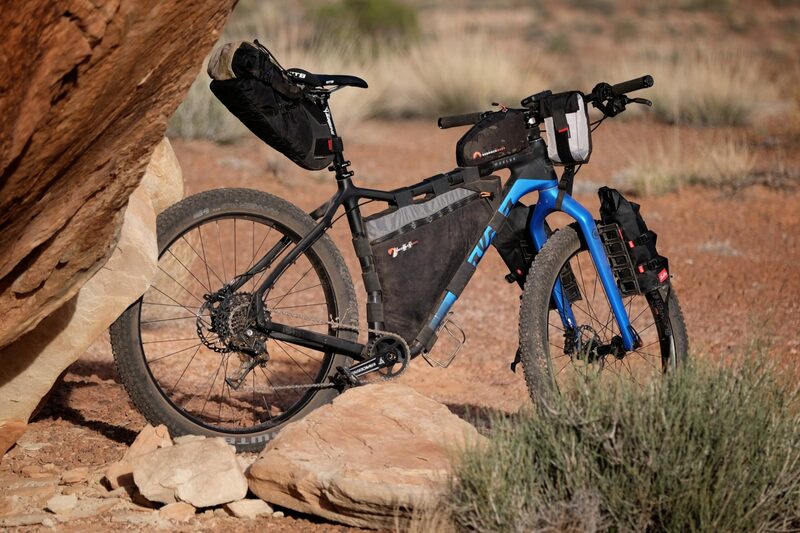 The key to packing your bike revolves around two primary considerations: You want to distribute the weight evenly as to not disrupt the bike’s handling qualities, while still leaving things you need close at hand. Heavy items like my water reservoir are placed low in the frame bag and in that location almost disappear. 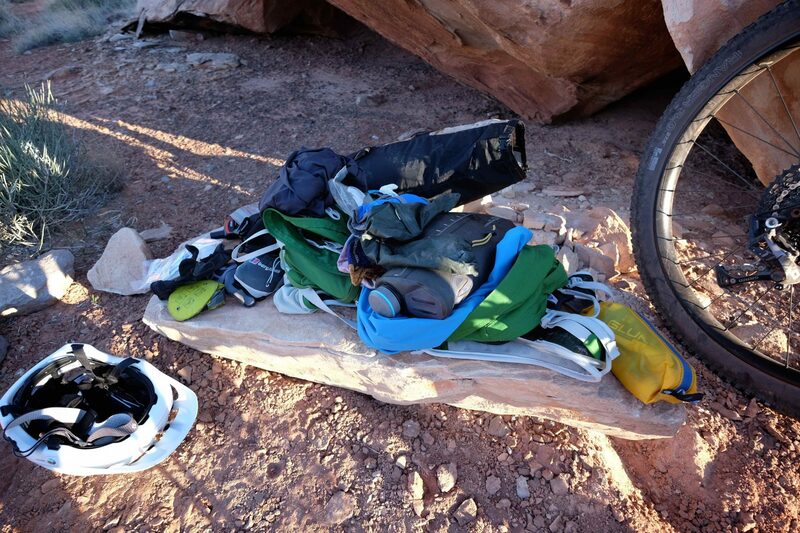 Light items like my sleeping bag, down jacket, and dehydrated foods, often get stashed in my seat bag. Slightly heavier items like extra clothing, my 2-pound tent, and extra food, get stashed in the fork-mounted cages. If using a bar bag, I try to lighten that load a tad. 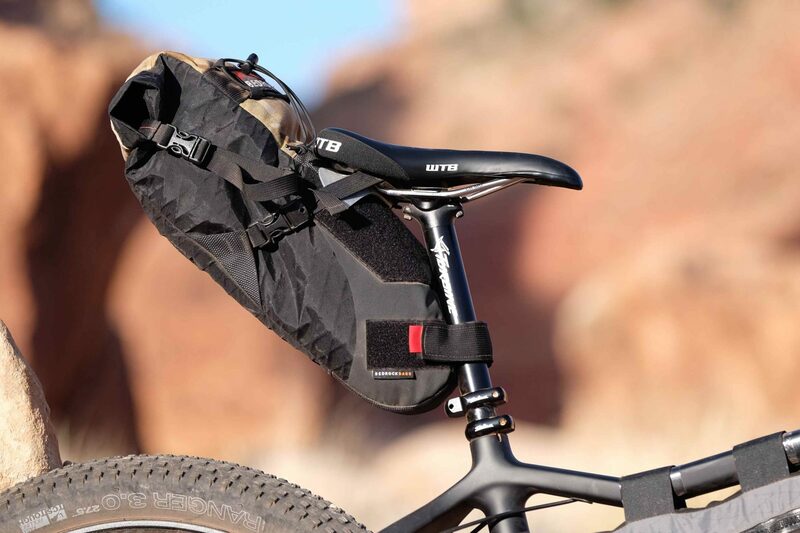 The fork-mounted cages, primarily a Salsa Cycles innovation, keep the weight low, solid, and secure and don’t clutter my bars. e mounted bag and a bar-mounted bag for quick-grab snacks and my GoPro camera which I use to document my trips. My emergency water supply rides under the down-tube. 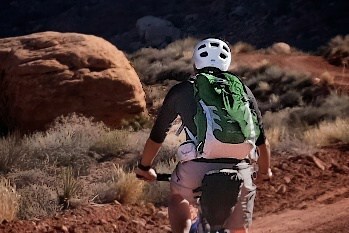 My backpack is an Osprey Talon 22, one of the most popular packs used for bikepacking. Mine is employed almost exclusively to carry a pro-level DSLR camera, two pro-level lenses, a tripod, and various photography tools and cleaning kits. It also holds my water, and all of my insulin and emergency supplies. Over countless trips spanning decades in the backcountry, I’ve come to learn it is often the seemingly insignificant things that make a huge difference in the success of a trip. On my last romp I forgot to bring extra AA batteries for my headlamp. On one outing, I forgot my chapstick and suffered dearly. Then there was the week I spent in the Grand Canyon eating with a stick I fashioned into a spoon because, well…. Never underestimate the little stuff. Even when you start with a shelter weighed in grams, the whole sum quickly adds up. A titanium spoon here, a toothbrush there, and before you know it another pound has crept in. For most of my trips, fitted with this degree of camp comfort, the whole package including my backpack probably clocks in at around 30 pounds once I add water. When distributed across my bike and body, it’s noticeable, but quite light. The only extra weight for me is 5-7 pounds of professional camera gear. For reference, when racing multi-day events, I can trim that weight down to a total of just 21 pounds, which is getting close to the bare minimum. For a 7-10 day trip like my exploration of Iceland’s Highlands, my total load might have pushed up to 40-42 pounds when geared up for a 5-6 day stretch without resupply.